“ Don't get involved in partial problems, but always take flight to where there is a free view over the whole single great problem, even if this view is still not a clear one. Getting hold of difficulty deep down is what is hard. Because if it is grasped near the surface it simply remains the difficulty it was. It has to be pulled out by the roots; and that involves our beginning to think about these things in a new way. It is only by thinking even more crazily than philosophers do that you can solve their problems. Copernicus' wise decision to publish his book On the Revolutions of the Heavenly Spheres led to profound advancements in knowledge and thinking. The book advanced peoples’ understanding of the heliocentric theory of the solar system, advanced the discipline of science and the advancement of the scientific method, and challenged the catholic church's exclusive claims on truth. Henry Louis Stephens, untitled watercolor ~1863) of a man reading a newspaper with headline "Presidential Proclamation / Slavery". President Abraham Lincoln wisely conceived of, drafted, and signed the Emancipation Proclamation which took effect on January 1, 1863, during the American Civil War. The proclamation is an order issued to all segments of the Executive branch (including the Army and Navy) of the United States by the President. It proclaimed all those enslaved in Confederate territory to be forever free, and ordered the Army (and all segments of the Executive branch) to treat as free all those enslaved in ten states that were still in rebellion, thus applying to 3.1 million of the 4 million slaves in the U.S. This proclamation strengthened the Union during the civil war, and foreshadowed freedom for all slaves. President Thomas Jefferson made the wise decision to purchase the Louisiana territories. On July 4, 1803 the United States acquired 828,000 square miles of land held by the French at a cost of less than 3 cents per acre. In 1867 the United States acquired 586,412 square miles of land from the Russian Empire at the urging of United States Secretary of State William H. Seward. The Alaska Purchase, set at $7.2 million, or about 2 cents per acre, was soon known as Seward’s Folly. In addition to its pristine wilderness areas and breathtaking landscapes, Alaska is commercially important for its oil and fishing resources. Foresight, determination, and immense construction efforts beginning in 1881 and lasting through 1914 built the Panama Canal. The canal cuts across the Isthmus of Panama and is a key conduit for international maritime trade. Wise decisions by several forward looking leaders resulted in completion of the First Transcontinental Railroad. This railroad line was built between 1863 and 1869 connecting the Atlantic and Pacific coasts of the United States by rail for the first time. Construction of the Interstate Highway System, named for President Dwight D. Eisenhower, started in 1956. These 47,182 miles of highway provide essential infrastructure for the United States economy and way of life. Each of these decisions was controversial, even considered foolish, at the time, but each represents remarkable foresight and determined effort to improve the well-being of future generations. None-the-less each of these accomplishments is tainted by some element of exploitation, and not everyone impacted by them would consider them wise. Conquest, cunning, and certainly swindle do not meet the standards of wisdom. The Marshall Plan was the American program of monetary support to help rebuild European economies after the end of World War II in part to prevent the spread of Soviet Communism. The plan was in operation for four years beginning in April 1948. The goals of the United States were to rebuild a war-devastated region, remove trade barriers, modernize industry, and make Europe prosperous again. The plan addressed each of the obstacles to postwar recovery. The plan looked to the future, and did not focus on the destruction caused by the war. Much more important were efforts to modernize European industrial and business practices using high-efficiency American models, reduce artificial trade barriers, and instill a sense of hope and self-reliance. President Harry S. Truman made the wise decision not to use atomic bombs in the Korean War. This was a departure from the past practice of using all available weapons in war and deferring to the decisions of military commanders on the use of particular weapons. This established precedence for civilian control of nuclear weapons and has prevented their use. During the war, General Douglas MacArthur had petitioned for the authority to use atomic weapons in the Korean theater and later revealed he had planned to drop as many as 30 atomic bombs on various targets throughout Manchuria. Truman made the unpopular decision to fire MacArthur on April 11, 1951. It is likely Truman did so to prevent use of nuclear weapons, and assert his authority as commander in chief, who is ultimately responsible for use of nuclear weapons. 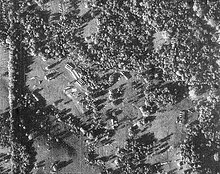 U-2 reconnaissance photograph of Soviet nuclear missiles in Cuba. Missile transports and tents for fueling and maintenance are visible. President John Kennedy made several wise decisions during the Cuban missile crisis of October, 1962. When reconnaissance photos clearly showed sites for medium-range and intermediate-range ballistic nuclear missiles under construction in Cuba, the United States considered attacking Cuba via air and sea. More than a third of the members of the National Security Council favored an unannounced air assault on the missile sites. This strategy would have probably led to a nuclear war. Instead the President decided on a military blockade, calling it a “quarantine” for legal and other reasons. This delicate strategy brought the world back from the brink of nuclear conflict. After negotiations with Digital Research failed, IBM awarded a contract to Microsoft in November 1980 to provide a version of the Operating System to be used in the upcoming IBM Personal Computer. Because Microsoft had no operating system at the time, they purchased a similar operating system from Seattle Computer Products to fulfill their obligation to IBM. Following the release of the IBM PC in August 1981, Microsoft retained ownership of MS-DOS, the operating system they leased to IBM. Largely as a result of the wise decision of Bill Gates to retain intellectual property rights to the software, Microsoft eventually became the leading PC operating systems vendor. Judging the wisdom of the agreement Microsoft reached with IBM certainly depends on your affiliations and point of view. While it is clearly wise from Microsoft’s point of view, IBM may look back on this decision differently. How might an objective observer, adopting a global perspective, judge this decision? A wise decision requires more than transferring assets, it requires an overall increase in value. Microsoft used financial strength it gained from this licensing agreement to develop software that has become very popular, and to some extent helped increase sales of IBM computers. It is difficult to know, however, how things might have turned out if a different deal was struck. When seven people died after taking Tylenol capsules poisoned with potassium cyanide, the manufacturer made wise decisions and swiftly took decisive action. On October 5, 1982, Johnson & Johnson issued a nationwide recall of Tylenol products; an estimated 31 million bottles were in circulation, with a retail value of over US$100 million. The company also advertised in the national media for individuals not to consume any products that contained acetaminophen. As a result, further deaths were prevented, tamper-evident packaging has become the norm, caplets have largely replaced capsules, and Tylenol remains a well-respected brand. On September 26, 1983, just three weeks after the Soviet military had shot down Korean Air Lines Flight 007, Stanislav Petrov—lieutenant colonel of the Soviet Air Defence Forces—was the duty officer at the command center for the Oko nuclear early-warning system when the system reported that a missile, followed by another one and then up to five more, were being launched from the United States. Petrov judged the report to be a false alarm, and his decision is credited with having prevented an erroneous retaliatory nuclear attack on the United States and its NATO allies that could have resulted in large-scale nuclear war. Investigation later confirmed that the satellite warning system had indeed malfunctioned. The wise decisions of Archbishop Desmond Tutu and others lead to the formation of the Truth and Reconciliation Commission in 1995. This restorative justice body assembled in South Africa after the abolition of apartheid was seen by many as a crucial component of the transition to full and free democracy in South Africa. Choose a wise decision from those described above, or from some other reliable source, to study. Study that decision in depth. Identify the particular problem formulation, knowledge, understanding, ideas, creativity, courage, persuasion, perspective, and choices that are the wisdom leading to the decision. Choose an unwise decision from the Case Studies section of the Grand Challenges course, or from some other reliable source. Study that decision in depth. Identify those critical characteristics throughout the process that differentiated the wise decision making from the unwise decision making. ↑ Why Did Truman Really Fire MacArthur? ... The Obscure History of Nuclear Weapons and the Korean War Provides the Answer, Bruce Cumings, George Mason University's History News Network, January 10, 2005. This page was last edited on 21 January 2016, at 16:58.